iPad 2.0: Apple Plans Valentine's Day Massacre? Nearly 56 million tablets are expected to be produced in 2011. 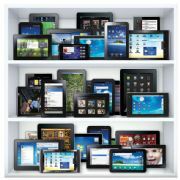 A new report from DisplaySearch uses information and trends from the display manufacturing industry to forecast an increase of more than 200 percent over 2010 tablet shipments. Getting Apple, Samsung, Motorola, or other tablet vendors to spill figures on expected sales is like pulling teeth in most cases--and understandably so. Announcing that you expect to sell 10 million, and then only selling one million can be rather humiliating. But, if the vendor never makes any upfront prediction, one million can be heralded as a victory. Behind the scenes, though, the vendor still has to have some ballpark numbers in mind. It has to be able to manage the logistics of manufacturing and shipping however many tablets it expects to sell, which begins with ordering enough parts to make them in the first place. With a little sleuthing, paying attention to backend suppliers can provide enlightening details about what the industry has in store. That is how DisplaySearch is able to weigh in on the growth of the tablet market. "The upcoming product announcements, introductions and demonstrations in the coming weeks will build on the tremendous momentum that the market has already seen and will lead to segmentation in the tablet (slate) PC market," said Richard Shim, mobile computing analyst for DisplaySearch. "This segmentation translates to significant shipment growth and proliferation in the short and long term." DisplaySearch expects that 7-inch and 10-inch tablets will continue to dominate the tablet size options. In order to deliver a 16:9 or 16:10 aspect ratio, some tablet vendors will adopt 10-inch widescreen displays. DisplaySearch also suggests that the explosion of the tablet market will cannibalize the netbook and low-end notebook markets. Intel may be inadvertently fanning those flames with the recent glitch with the Sandy Bridge chipset. As the variety of tablets grows, and the functions and capabilities of those tablets expand, the continue to encroach on the realm of netbooks and notebooks. Some analysts have projected that Apple alone plans to produce nearly 50 million iPads in 2011. If true, that would mean that Apple alone would account for nearly 86 percent of the total tablets predicted by DisplaySearch. Either the Apple estimate is wildly high, rival tablets have very timid production plans, or the DisplaySearch figure is on the low end. Suffice it to say that all signs indicate that 2011 will truly be the year of the tablet, and possibly the beginning of the end for netbooks.